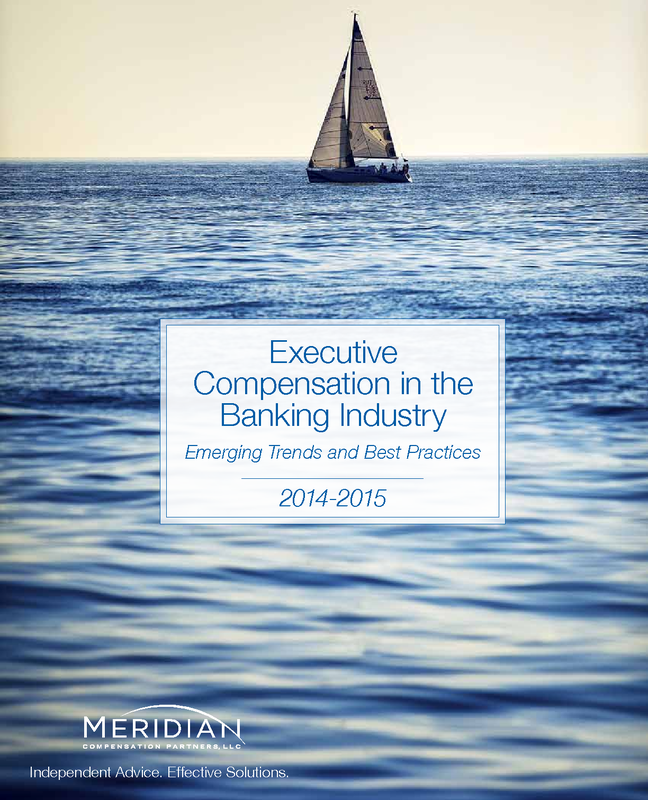 This is Meridian’s second annual white paper on trends impacting the banking industry (see “New Realities of Executive Compensation in the Banking Industry” for the 2013-2014 white paper). Our research for this paper represents data from Meridian’s review of 2015 proxies for U.S. banks with assets between approximately $10 billion and $400 billion. This perspective was selected as representative of the group of banks already on the front line of regulator and shareholder scrutiny. Trends faced by these banks provide an indication of the emerging themes and changes likely to cascade down to the broader banking industry. 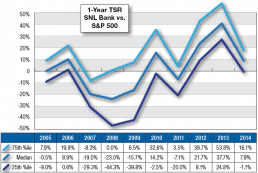 It is important to realize that bank compensation has and will continue to evolve. Regulators will continue to push their agenda, and we still await final regulations from the Dodd-Frank Act of 2011 (e.g., clawbacks, hedging, pay for performance, CEO pay ratio, incentive risk management). Meanwhile, shareholders will continue to demand variability in pay that aligns with performance results. We look forward to continuing to monitor these evolving trends. If you have questions on any of the data/topics discussed, please do not hesitate to contact one of our team members listed above who will be happy to help. The banking industry has been through significant turmoil the last eight years, surviving a severe financial crisis and unprecedented regulatory reform. Banks today have emerged from this crisis with a newly defined focus on growth and profitability that must be achieved amid costly regulatory compliance and expense management pressures. In addition, shareholders continue to put pressure on banks to deliver improved shareholder returns. Unlike other industries, banks face intense scrutiny from two dueling and powerful constituencies: 1) bank regulators such as the Federal Reserve, and 2) shareholders and advisory firms such as ISS and Glass Lewis. With increased scrutiny on compensation and governance practices, banks continue to balance differing perspectives as they seek to design effective compensation programs and reward executives in line with performance. Industry performance has improved and pay levels have increased at a modest level (with a larger bump in 2013). Banks will continue to manage a challenging environment to improve profits and find risk-appropriate ways to motivate and reward executives. Our second annual research report highlights some of the newer trends, best practices and considerations related to executive compensation and governance. As a result of the financial crisis, bank regulators continue to expect banks to reduce compensation-related risk and create a longer-term perspective when rewarding executives. On the other hand, investors want executives to drive high performance and be aligned with shareholder interests. Our data show some “standard” compensation and governance practices that are generally accepted as market practice as well as “emerging” practices that are not yet widely adopted but considered best practice. Some of the policies stem directly from the Dodd-Frank Act (Dodd-Frank) while others reflect a general trend of enhanced governance expectations. 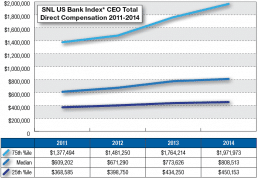 Compensation data from SNL Financial. *Consists of 304 companies within the SNL US Bank Index that filed 2015 proxies prior to May 22, 2015. Standard policies tend to be universal regardless of asset size. On average more than 80% of banks in our database have these policies in place. Stock Ownership Guidelines. Stock ownership guidelines require executives and directors to hold a defined amount of company stock, typically a value denominated as a multiple of executives’ base salary or directors’ annual cash retainer, with an expectation that such ownership will be achieved within a five-year time frame. These requirements are intended to demonstrate executive and director commitment to stock ownership and alignment with long-term shareholder interests. Clawback Policy. Clawback provisions have emerged as common practice despite the lack of proposed or final Dodd-Frank rules. These policies allow companies to recoup incentive payments if there is a financial restatement, “bad behavior” and/or poor financial outcomes. Most policies will need to be updated once final rules are published by the Securities and Exchange Commission. Anti-Hedging Policy. A hedging transaction allows a participant to protect against or offset any decrease in the market value of company stock. In February 2015, the SEC released its proposed rule, which will require public companies to disclose the types of hedging transactions (if any) allowed and the types prohibited for both employees and directors. While the SEC hedging disclosure rule has not been finalized, most companies have policies prohibiting hedging activities by both employees and directors. ISS adopted a policy in 2012 that any hedging of company stock by executives would result in an automatic withhold vote recommendation for directors. While it was already common practice to prohibit hedging transactions, this ISS policy caused many companies to adopt and disclose formal policies. Emerging policies are increasing in prevalence and more dependent on asset size (i.e., more prevalent at larger banks that are under greater regulatory scrutiny). Banks over $50 billion in assets tend to have these practices although “trickle down” is expected to occur throughout the industry. Pledging Policy. 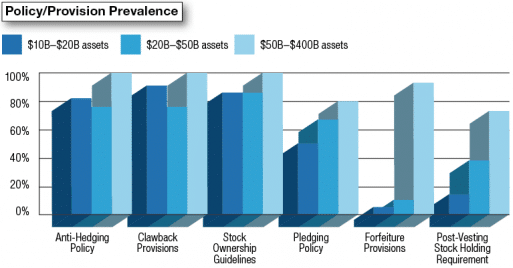 Not as prevalent as anti-hedging policies, pledging policies prevent or limit executives’ and directors’ ability to pledge company shares as collateral for loans. Since 2006, public companies have been required to disclose the amount of company stock pledged by executives and directors, but recently pledging of shares has come under scrutiny from ISS. While any amount of hedging automatically results in a negative vote recommendation from ISS, there must be “significant” levels of pledging to raise an issue with ISS. Forfeiture Provisions. In response to regulatory pressure, and to offset the challenges associated with enforcing clawbacks (which are after-the-fact recaptures), many of the larger banks have adopted practices that allow the bank to cancel or adjust an outstanding award before it is paid or vested. It is easier to adjust before an award is paid rather than try to recoup or clawback after payment is made. Almost all of the largest banks in our study who have faced the most regulatory scrutiny have forfeiture provisions on incentives prior to payment or vest. Post-Vesting Stock Holding Requirement. Holding requirements are an emerging practice at larger banks. Holding requirements require executives or directors to hold shares owned (post-vesting) for a certain number of years (generally one to two) or in some cases until or after retirement. These requirements apply even if an executive has met the stock ownership guidelines. This practice serves as an effective risk mitigation feature because it enhances the ability to enforce clawbacks and reinforces shareholder alignment through long-term stock retention. In some cases such requirements may also lower a company’s accounting expense when a liquidity discount is applied for the extended hold period. It continues to be a challenge for banks to design effective incentive programs. The determination of pay mix, selection of performance metrics/goals and payout ranges are often subject to Monday morning quarterbacking by regulators, shareholders and advisory firms like ISS and Glass Lewis. Incentive, or performance, pay constitutes a significant portion of executive total compensation. As shown on the following page, the CEO pay mix at larger banks includes a greater proportion of pay in equity and long-term incentives than does CEO pay mix at smaller banks. In recent years, the larger banks have been subject to heightened scrutiny from regulators. Regulators prefer that a significant portion of incentive compensation is long-term or “deferred.” Under Dodd-Frank Section 956, banks with assets greater than $50 billion must ensure half of total incentives granted (annual and long-term) are deferred. Deferrals most commonly are made through long-term incentive programs (such as equity awards). Performance measures should reflect the strategic objectives of the bank and ultimately drive long-term shareholder value. Annual incentives are often tied to budget goals, while the long-term plan reflects the cumulative results over multiple years. The choice of performance measures serves as a “road map” which defines performance expectations for executives, employees, regulators and shareholders. 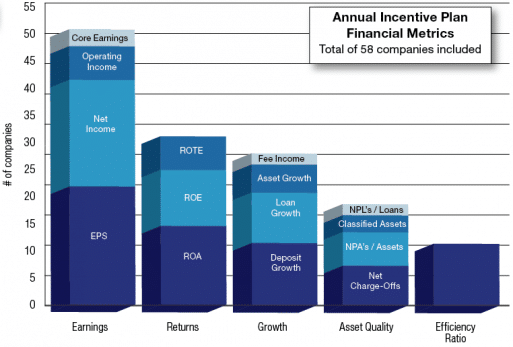 Annual incentive plans often use a formulaic approach (50% of banks) or a combination of formula and discretion (40%). Only 10% of banks use a fully discretionary approach. For those banks using formulaic goals, earnings measures (such as EPS and Net Income) remain the most heavily weighted metric followed by returns, growth (deposit and loan) and asset quality. While the average weighting of measures in 2014 plans remained similar to 2013, there was a small increase in deposit and loan goals as banks increased their focus on growth. There was also an increase in measures outside of the above categories, as banks increasingly are evaluating performance from a broader strategic and holistic perspective. 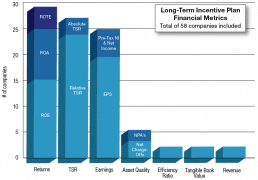 Approximately 40% of long-term incentive plans use a return measure (more specifically ROA and ROE) and just under 40% use an earnings measure. Consistent with broader industry trends, there is an increasing use of Total Shareholder Return (TSR) in place of, or in addition to, other measures. While using TSR may ensure alignment with shareholder value creation, executives have less direct influence on the economic and market influences that often drive TSR. Since no one measure is perfect, many banks (58%) use two or more measures to provide a more balanced approach to measuring long-term success. One of the most challenging tasks banks struggle with is establishing performance goals and payout ranges. It is difficult to assess the appropriateness of goals at the beginning of the performance period when there is significant uncertainty about the economic environment that the bank will be operating in during the performance cycle. This is particularly true for multi-year performance cycles. Many banks (almost 70%) use relative performance goals for long-term incentives, which eases the goal setting process, particularly for multi-year goals. However, regulators have expressed concern with plans that rely on relative performance measures, as they believe it may cause banks to “chase” peers and increase risk. Accordingly, we are seeing an increase in the use of a combination of relative and absolute goals, sometimes in the form of an absolute “trigger” measure which must be met before any payout can be earned. Typical practice in larger banks and general industry has been to vary incentive award payouts from 50% of target to 200% of target depending on actual performance. However, the Federal Reserve has pushed back on the practice of providing upside leverage to reward performance, especially for long-term incentives. Consequently the largest banks have reduced the maximum awards to 125%–150% of target. This is cascading to the next tier of mid-sized regional banks. Market data on peer compensation levels and practices provides a valuable reference for evaluating compensation levels and programs. However, benchmark data by itself does not provide the complete picture. Pay for performance analyses, tally sheets and internal equity assessments represent important reference perspectives that provide a broader array of information to assess the effectiveness and appropriateness of compensation programs. It’s safe to say that everyone agrees in the principle of pay for performance. The challenge and debate, however, is in its definition and assessment. There are a variety of ways to evaluate the relationship between pay and performance; and while none are perfect, they can provide a valuable directional assessment of historical pay decisions. One method of assessing the pay and performance relationship is to evaluate annual incentive payouts in the context of relative performance. Annual performance goals are typically set at the beginning of the year based on internal expectations. Looking back to see how payouts compared to internal budgets, peer performance and investor expectations can help assess whether goals are being set at an appropriate level of difficulty. Annual assessments only tell part of the story. It is also important to evaluate pay-performance alignment over longer time horizons. Long-term incentives, which are generally the largest component of executive pay, play a critical role in the pay and performance relationship. When granted in equity, long-term incentives help ensure the ultimate value received by executives is aligned with shareholder value creation. Multiple-year pay and performance analyses typically focus on realized or realizable pay. Realized pay reflects value actually received (including value from option exercises and stock vesting) by executives during a defined time period, while realizable pay assesses the current value of all pay granted during the period (even if not yet fully vested). Both approaches are helpful, but neither reveals the complete picture. In April 2015, the SEC released a proposed rule, mandated by Dodd-Frank, which would require most public companies to disclose a new table showing executive compensation “actually paid” and Total Shareholder Return performance over a five-year period (with a phase-in period that starts with a three-year disclosure). TSR for the company’s peer group is also proposed to be included in the table. The pay disclosure will be similar to many definitions of realized pay, although stock options are proposed to be based on a calculated value at vest date (e.g., Black Scholes) as opposed to spread value at exercise. Following this table, companies must explain or illustrate the relationship between compensation actually paid and their own TSR, as well as the relationship between their TSR and their peer group’s TSR. Many questions remain about the proposed rule, but ultimately, like all pay for performance disclosures, it will be an imperfect assessment that cannot be reduced to a simple table or graph. Companies will need to craft thoughtful explanations of the data in the mandated table to make the information understandable and meaningful for investors. It is important to evaluate whether the information revealed in the tally sheet aligns with the bank’s desired compensation philosophy. For example, do incentive payouts appear reasonable based on the bank’s performance? Does the amount of unvested incentive awards provide appropriate retention hooks for high performers? An increasing amount of attention is being paid to internal pay equity comparisons. 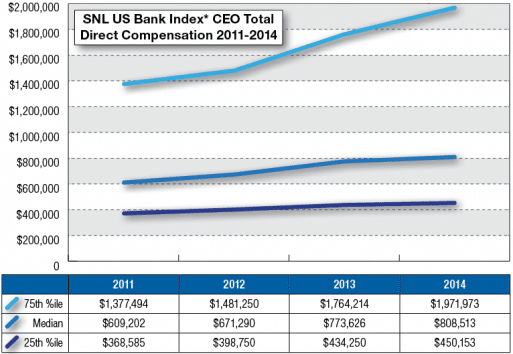 The Dodd-Frank required CEO Pay Ratio remains pending. The proposed rule, issued by the Securities and Exchange Commission in 2013, would require public companies to disclose the ratio between compensation for the CEO and that of the median employee. This ratio will be challenging for companies to calculate and for investors to interpret, given the wide differences in company workforces. We expect the disclosure, once implemented, will generate significant media attention and benchmarking. However, this static number will be limited in its usefulness for compensation committees and investors. 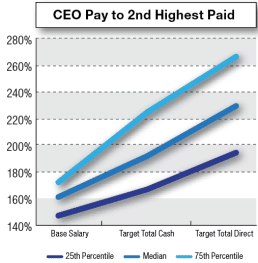 What may be more useful is the ratio between CEO pay and that of other executives. Some investors use comparisons between CEO pay and other executives to provide insight into the quality of succession planning and the level of power concentrated in the CEO. However, ratios can often vary based on the structure of the executive team (e.g., whether there is a COO) and their tenures. Internal pay ratios can be complicated to interpret for a variety of reasons, but it is important to evaluate the consistency of executive pay actions with pay decisions being made for the rest of the workforce. 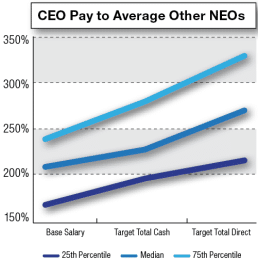 The tables below show the ratios of the CEO to the second highest paid and the average of Named Executive Officers. In today’s environment of increased scrutiny of governance and pay practices, proper disclosure and documentation is critical. Below are a few areas of continued focus. Proxy/CD&A. 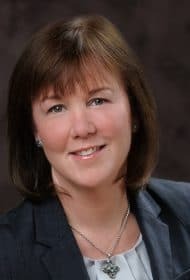 After five years of Say on Pay votes, companies have learned that the proxy, specifically the CD&A, provides a powerful opportunity to “tell the story” and clearly communicate the structure and purpose of the executive compensation program. Many banks have enhanced the proxy statement through a proxy summary, executive summary for the CD&A, realized/realizable pay disclosures, and pay-performance alignment charts or graphs. Enhanced disclosure will continue to be a focus with the implementation of the SEC’s new pay for performance disclosure rules. Succession Plans. Every bank should have a succession plan that is clearly documented. Succession plans are critical from a risk management perspective as well as to ensure continuity of the business in the event of an emergency or planned transition of executive leadership. Companies that focus on leadership development and succession are most likely to survive the unexpected and create growth opportunities that attract and retain top talent. Compensation Committee Charters. Most banks review committee charters and calendars regularly to ensure that they comply with NYSE and Nasdaq requirements. But it is also important that the charter documents the committee’s responsibilities and cross-references these responsibilities to the committee’s annual agenda. This will ensure that the committee is fulfilling all of its responsibilities and may highlight areas that the committee should have authority over but that are not explicitly stated in the charter. Compensation Committee Minutes. Another set of documents that regulators may request are committee minutes. It is important to accurately document committee meetings including attendees (committee members versus invited guests such as management), discussion items (including committee questions and challenges), the results of motions (e.g., what was approved and who voted) and the occurrence of an executive session. Executive compensation and governance practices in the banking industry have undergone a significant transformation in recent years. Challenges will continue as Dodd-Frank provisions are implemented and banks continue to respond to increased expectations from regulators and shareholders. While the largest banks are under the greatest pressure, the policies and emerging best practices are cascading to smaller banks. Meridian will continue to analyze and update our bank proxy database each year to monitor trends and practices across the banking industry. Please let us know if you are interested in any custom cuts of our database. Meridian Compensation Partners, LLC is an independent executive compensation consulting firm which provides trusted counsel to Boards and Management at hundreds of companies. We consult on executive and Board compensation and governance. Our many consultants throughout the U.S. and in Canada have decades of experience in pay solutions that are responsive to shareholders, reflect good governance principles and align pay with performance. Our partners average 25 years of executive compensation experience and collectively serve over 450 clients. Over three-quarters of our engagements are at the Board level. Meridian is dedicated to serving the banking/financial services industry. 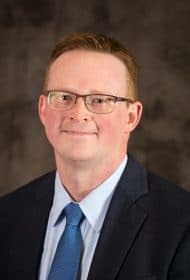 We have team members across our offices who “live and breathe” the issues facing the banking industry, and we have built our reputation through long-term relationships and high-quality advice. We understand the diversity of banking business models; evolving regulations; and how to align each client’s unique strategy, culture and philosophies into customized pay programs that best meet their needs. Our work spans banks of all sizes, ranging from de novo to the largest financial service organizations.